Love, effort and energy have been put into the restoration of this old casolare (country house) in Montecorice by the owner, who lives in Switzerland. The result is remarkable: On a property of more than 1,300 m², Villa Marina with its lovely stone façade represents the manor of an ancient farm complex. Flourishing bougainvillea and roses, head-high cactuses as well as olive and fig trees add Mediterranean charm. While staying at this holiday home you are sure to enjoy life out in the open to the full, for example on the ca. 200 m² terrace with sea view in front of the house: share your meals there, relax on one of the sun beds or indulge in your holiday read in a quiet, shady spot. The sea-view balcony on the upper floor runs along the entire length of the house. Your 140 m² holiday home covers two floors, high ceilings provide for an airy atmosphere. In the ca. 30 m² living-dining room on the ground floor of Villa Marina you can share meals with your family or friends and build a fire in the fireplace in the evening. 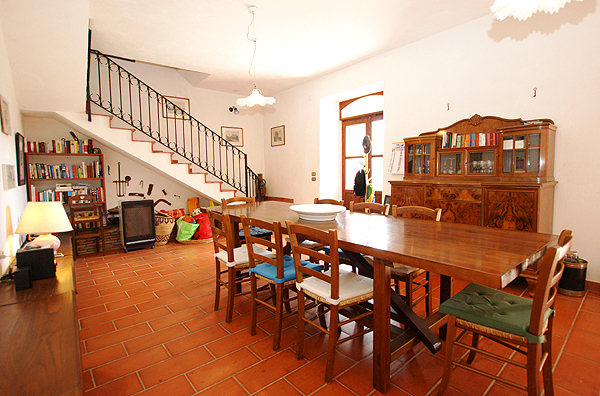 The living/dining room offers access of the terrace and the upper floor of your holiday home. The kitchen, which opens onto the terrace, too, is 'separated' from the living room by a nice stone arch. Solid wood characterizes the fitted kitchen, which is well-equipped and includes a dishwasher as well as a German-type coffee machine; there is a dining table with four chairs in the kitchen area. A guest WC with bidet and a washing machine are also found on the ground floor. 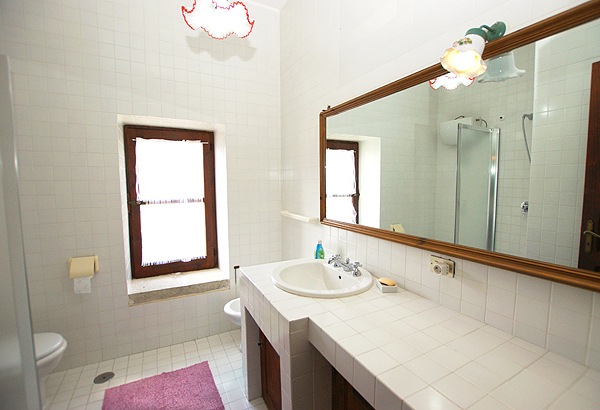 The four bedrooms with a double bed and air conditioning each are found on the upper floor. Three of the rooms open onto the balcony. One of the rooms with access of the balcony has an en-suite bathroom with shower/bidet/WC. 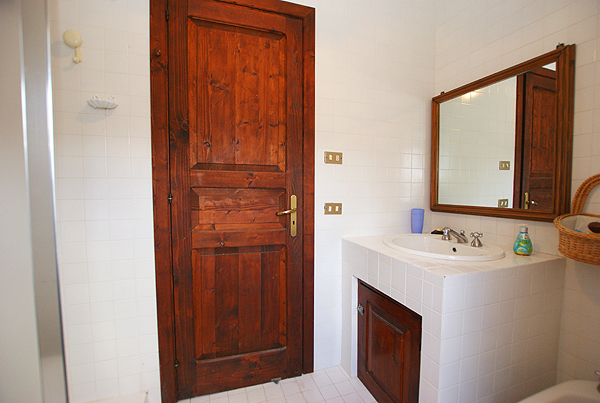 The second bathroom with shower/bidet/WC is accessible from the hallway. In one of the bedrooms with access of the balcony the double bed can be rearranged into twin beds. The fourth room (without balcony) offers additional sleeping facility for a third person (single bed) as well as a children’s cot and is furnished with a fireside. On the brick-work grill in the out-door area you can prepare delicious holiday specialties. The outdoor shower might be quite welcome after returning from a day spent at the beach. Parking is available on the premises. The owner would be grateful, if you could water the plants around the terrace every now and then, should this be necessary and, of course, depending on the weather. 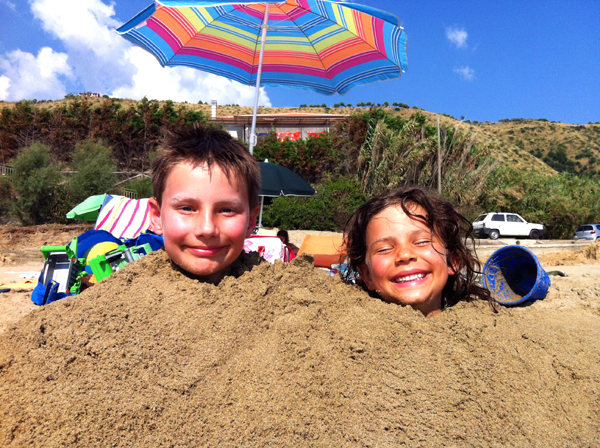 The nearest beach (pebbles, rocks) is at San Nicola a Mare and about 3 km off. If you love sandy beaches, you should go to the smaller beach near Agnone and to the marvelously wide sandy beaches near Acciaroli. 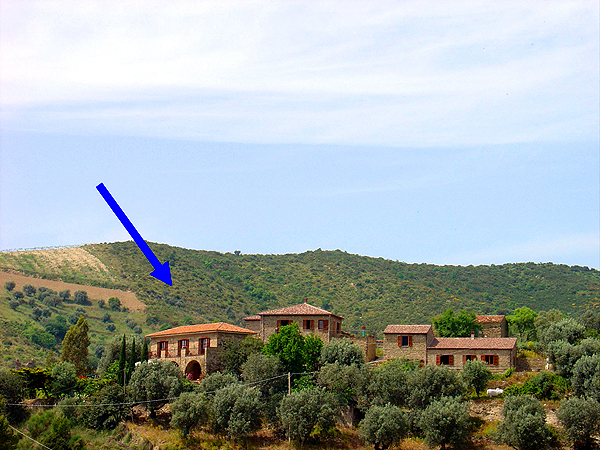 Your holiday home is located in the district of Roviscelle. Grocery stores and café bars are found in the main village of Montecorice 2 km off. 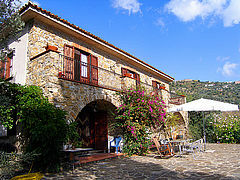 The owner has also renovated the two outbuildings of Villa Marina, the main building, and occasionally uses them himself or rents them to friends. The other two buildings on the premises have not been renovated. A worthwhile hike along the coast, with stretches along the seaside and through fragrant macchia, takes you to Punta Licosa, the Sirens’ cape. The cape and the offshore island are named for Leucosia, the Siren who according to legend sought death there as Ulysses – seemingly unimpressed by her song – had his men keep on rowing and pass her by. If you prefer to explore the Cilento hinterland on foot, you might hike from Pioppi to Acciaroli, for example. Walking along traffic-free roads and country paths you meet with marvelous views. Climbing Monte Stella is also worth the effort. From its peak you can look far into the south of Campania. 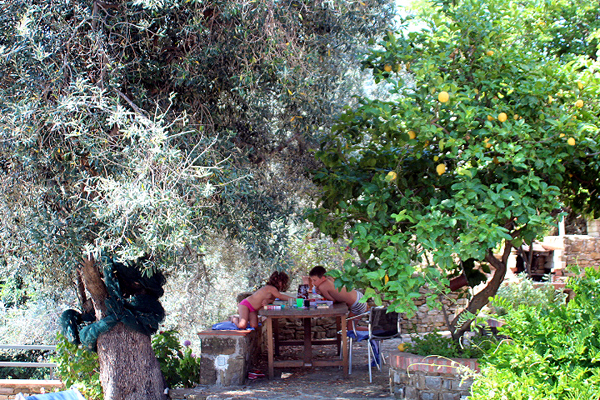 Take in the rural face of the Cilento: it is worth it! Villa Marina is a lovingly restored, old casolare in the gentle and green hilly landscape of Montecorice. 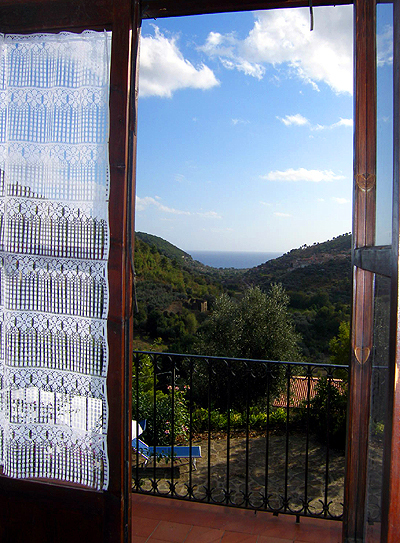 From the terrace and the balcony, the sea and Montecorice are always within view (guest picture Schäfer). Spending time out in the open: the large, ca. 200 m² terrace in front of the holiday home. Enjoy the gorgeous Italian sun and - unwind. Large living and dining area on the ground floor with access of the terrace. The well-equipped kitchen is 'separated' from the living room by a round arch. From the kitchen you have got access of the terrace, too. View of the sea from the terrace on the ground floor. Sofa 'corner' at the fireside – make yourself comfortable and take it easy. The more than 30 m² living/dining room on the ground floor and the adjoining kitchen. The solid wooden kitchen of Villa Marina. On the upper floor there are four bedrooms and two bathrooms. Three of the bedrooms open onto the sea view balcony. The balcony accessible from 3 of the bedrooms. The largest of the four bedrooms with a double and a single bed and enough space for a cot. There is a door to the inner courtyard, which, however, remains locked. The largest bedroom is furnished with a small fireside. This bathroom with shower is accessible from the hallway. Another bedroom with double bed and access of the balcony. View of the sea from the bedroom. 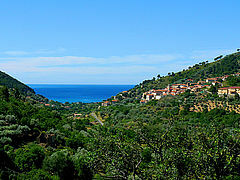 Villa Marina is surrounded by soothing green. Welcome to your holiday home Villa Marina. In the mood for a sun bath? Head-high cactuses next to Villa Marina. A barbecue is found behind the house. Die allgemeine Sauberkeit in der Region hat uns positiv überrascht. Die Küstenstraße bietet wunderbare Ausblicke. An Villa Marina fanden wir die drei Toiletten praktisch und die Außendusche. Lage und Ausblick waren hervorragend. Die Küche war gut ausgestattet: ausreichend Geschirr. Nicht verpassen sollte man die Calore Schlucht und die Grotta Azzurra. Es hat uns hier sehr gut gefallen. Die Landschaft ist wunderschön, das Essen gut und sehr günstig. Es gibt wenig deutsche Touristen und das Freizeitprogramm ist abwechslungsreich. Villa Marina war eine super Unterkunft: tolle Lage, Terrasse mit Außendusche und tollem Blick, perfekte Ausstattung (vom Geschirr bis zu Spielen war für alles gesorgt). Man sollte unbedingt Schnorcheln gehen und mindestens einmal den Sonnenuntergang ijn Velia genießen. Die Gegend ist touristisch noch nicht überlaufen - da kommen wir doch gern einmal wieder! Wir haben uns hier sehr wohl gefühlt: die schöne Landschaft, die Freundlichkeit der Bewohner, die guten und frischen Lebensmittel. Die Lage des Ferienhauses ist prima. Bei der Ausstattung fehlt rein gar nichts und die Gastgeber sind sehr zuvorkommend. Jeder Tag im Cilento war ein echtes Erlebnis. hier wird einem nie langweilig - daher kommen wir sicher mal wieder. Die Villa Marina ist wirklich ein sehr schönes Haus mit toller Terrasse und herrlichem Meerblick. Die Gegend - ganz frei von Hotelburgen - ist absolut bezaubernd mit ihrer wunderschönen Landschaft, dem traumhaften Meer und den kleinen Dörfern. Ein Besuch in Paestum ist ein Muss ebenso wie der Genuss der phänomenalen lokalen Küche. Im Ristorante Costantinopoli oberhalb von Pollica gibt es sensationelle Pasta bei traumhaftem Ausblick. Wir waren rundum zufrieden und haben uns bestens erholt... nicht zum letzten Mal in dieser Gegend! Prices per week for the holiday home are valid for the number of persons given in brackets and incl. bed linen, towels and final cleaning. * In travel periods 06.10.2018-25.05.2019 and 05.10.2019-04.01.2020 a surcharge of 25 Euro/ week is charged for the 5th to 8th persons each. In travel periods 25.05.-29.06.2019 and 31.08.-05.10.2019 a surcharge of 25 Euro/week is charged for the 7th and 8th persons each. - The costs for the air conditioning and the electric furnaces are charged on the spot according to use (separated electric meter).